There are several types of facial skin problems that can be due to many causes. It can be cosmetically distressing to the person, as the face is the main site one worries about in order to maintain good looks. In this article, we are going to list different types of facial skin problems and treatments for it. Acne is one of the most common skin problems of the face which usually affects the face but can also occur over neck, chest, and back. Most people with acne are aged between 12- 25 years. Severity can range from mild to severe. Acne is caused by overactivity of sebaceous glands in the skin. Sebaceous glands are situated under the skin surface, which produces sebum (oil) that keeps skin supple. The sebum comes out through tiny pores. When these pores get blocked by thickening of the skin and dead cells the sebum collects under these blocked pores. There is a bacterium called Propionibacterium acne which is normally found in the skin. It multiplies in trapped sebum. Sometimes inflammation occurs making the surrounding skin red. These red spots can enlarge and fill with pus. Acne can be associated with open comedones (blackheads) or closed comedones (whiteheads). There are various topical medications used to treat acne, such as retinoids, benzoyl peroxide, topical antibiotic gels etc. When severe oral antibiotics like doxycycline and antihormonal treatment are used by the dermatologists. 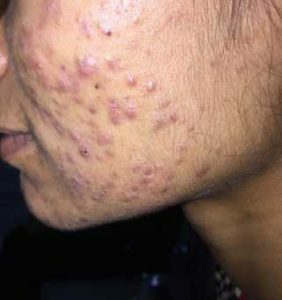 Even after successful treatment, acne can always recur. Always keep skin clean and use a suitable medicated cleanser twice a day. Never break or squeeze acne as it can lead to infection, worsening of acne and even scarring. 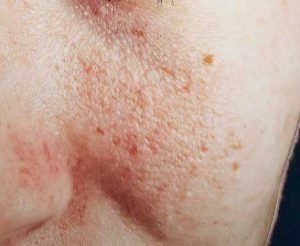 Rosacea is a skin condition which is common in the white-skinned population usually in between 30 – 50 years of age. Women are affected more than men in such skin problems of the face. There are redness, flushing and visible blood vessels over face, sometimes associated with acne-like breakouts. 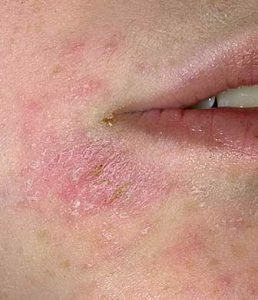 The rash is mainly over the nose and cheeks but can spread beyond to involve forehead and chin. Rosacea can run in families. Common triggers for flare-ups are overheating and humidity, cold wind, certain foods etc. 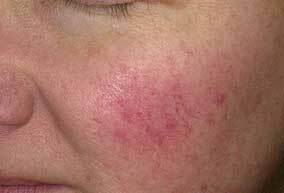 Treatment of Rosacea – Dermatologists can help to reduce or control skin symptoms and prevent it worsening. There is no cure for Rosacea. In this condition, the skin loses its pigmentation. In Vitiligo, the body’s own immune system attacks the melanocytes which produce the pigment melanin which gives us color. When they are destroyed they can no longer produce melanin, thus making the area white or hypopigmented. 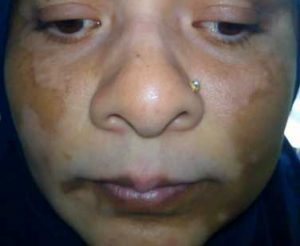 If it occurs in the face it is commonly around lips, although vitiligo can occur anywhere in the body. Sometimes there is a family history of a relative suffering from it. These white patches are more apparent in dark-skinned individuals. This is one of the long-term skin problems of the face. Vitiligo is difficult to treat and there is no cure. The earlier you visit your doctor, easier it is to diagnose and treat early to prevent spread. The treatment options are the application of topical steroids and tacrolimus, phototherapy, invasive procedures etc. The person can use camouflage make up over the lesions to cover the patches. Systemic Lupus Erythematosus is an autoimmune disease where autoantibodies are formed which mistakenly attack and damage healthy tissues and organs in the body. Lupus can affect not only the skin but also kidneys, blood vessels, nerves, and lungs. There is a typical rash on face called the “Malar rash” or the “butterfly rash” because of its appearance. They will also have systemic symptoms like fever, headache, arthritis (Joints become inflamed and be swollen and painful). Treatment – It is a chronic disease and there is no cure. The patients diagnosed with SLE need long-term medical management and follow up with a multidisciplinary team. Hives can occur not only on the face but anywhere in the body. They are itchy red or skin colored raised bumps with a surrounding red halo. When pressed on it, the bump becomes white or pale and when released it gets back to the previous color. 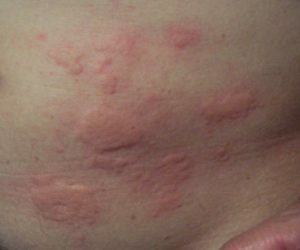 Although hives are quite common, the allergic reactions do not occur in everyone. It is due to hypersensitivity to the allergen in certain individuals only. They usually settle once the allergen is removed. Sometimes the allergic reactions may be severe and cause anaphylaxis, which is life-threatening. If the urticarial rash is associated with any of these following symptoms immediate medical attention is necessary. These symptoms are difficulty in breathing, swallowing, dizziness, faintish, chest pain or swelling of eyes and lips. If you experience any of these symptoms, rush to an Emergency room or dial 911. 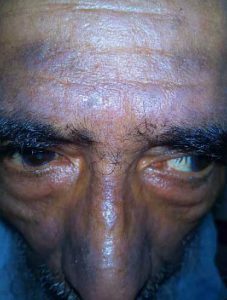 These are flat brown color patches which appear over the face (especially nose, cheeks) and other sun-exposed areas of the body. They may occur in crops. 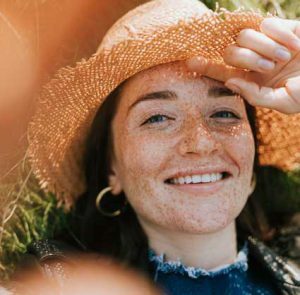 Freckles are difficult to treat, but avoiding sun exposure and using a good sunblock (SPF 30 -50) can avoid further spread. Apply a cream containing Hydroquinone which inhibits melanin production. With the long-term application, gradually these spots will fade away. If no response LASER treatment is an option. Eczema or Atopic dermatitis although commonly seen over limbs in adults, the face can be commonly involved in children and babies, such skin problems of face make you look weird. This is a chronic skin condition, which can run in families. It is associated with dry skin and itching is a common symptom in eczema. Treatment options – If eczema is mild, over the counter steroid product like hydrocortisone cream can be applied over the rash. Itching can be relieved by an antihistamine which can be bought over the counter. However, if the rash is severe and is not responding to OTC products seek medical help. Wrinkles usually occur due to aging. However, wrinkles can appear due to excessive sun exposure, tobacco smoking, environmental pollution, nutritional deficiencies, and stress. Skin becomes lax and sags due to loss of elasticity. Wrinkles are common around the eyes and mouth. The dry skin accelerates getting wrinkles. There are several treatment options for wrinkles. Using an over the counter anti-aging moisturizing cream containing antioxidants, retinol, and peptides may help. There are also prescription creams like topical retinoids which visibly reduces wrinkles. Since the skin becomes sensitive following use, sun protection is a must. There are several skin resurfacing techniques which can be used to remove wrinkles. These should be done by professionals. Injectables like Botox, using fillers and facelifts, LASER wrinkle removal, plastic surgery are some of the options which are expensive but found to be effective. 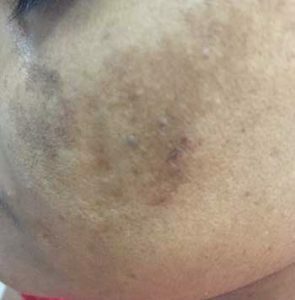 This is a chronic condition over face resulting in brown, blotchy pigmentation especially over cheeks. This is usually symmetrical. It is common in women over 40 years and in Asians. There can be a family history because of genetic predisposition. Melasma can occur due to sun exposure and hormonal changes as in pregnancy, use of oral contraceptives, hypothyroidism (low thyroxin levels in the body) etc. Melasma is difficult to treat as the pigmentation is deep, as it occurs due to overproduction of melanin. Long-term application of a cream containing hydroquinone will gradually help the patches to fade. Sun protection with a good sunscreen will prevent worsening of Melasma. Psoriasis is a chronic skin disease and well-known skin problems of the face, which is characterized by dry, itchy, scaly patches over the skin. These plaques can be pink, red or purple in color. 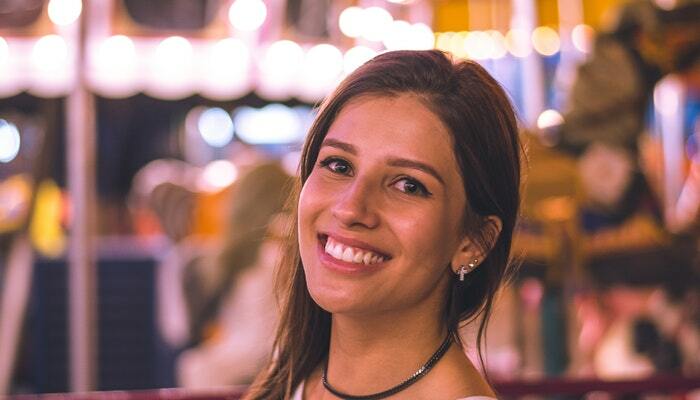 Although the rash can occur anywhere in the body, when it occurs in the face it can be around hairline of forehead, eyebrows, surrounding the ears etc. The reason for psoriasis can be genetically triggered by environmental causes like smoking, stress, certain foods, excessive sun exposure, and pollution. It is not contagious. Psoriasis can be best treated by a dermatologist as it is a chronic disease. There are several treatment options like the application of topical steroids, light therapy (phototherapy with UVB or PUVA) and oral immune suppressant medications. Long-term follow up is necessary. Even after successful treatment, the lesions can recur. If you are suffering from facial skin problems and want to get treated, check your skin condition initially with “Tibot”. Diagnose your skin now and get probable skin condition.